The person who said ‘talk is cheap’ never imagined a five-minute presentation. Speaking at a clip of 160 words a minute, five minutes gets you about 800 words. With this kind of verbal economy at play, talk is not cheap. Of all the live presentation events, Ignite is one of the most popular. The love child of Brady Forrest, Bre Pettis and O’Reilly Media, a Silicon Valley technical publisher, Ignite is more like SXSW than TED. Events are produced by local volunteers in more than 100 cities around the world. Ignite provides the stage, then it’s up to the speaker to enlighten, stimulate and entertain the audience. What separates Ignite from other talk-is-chic events is its perfect balance of form and function: Based on its motto, ‘enlighten us …. but make it quick’, Ignite speakers get five minutes and 20 slides that auto-advance every 15 seconds. 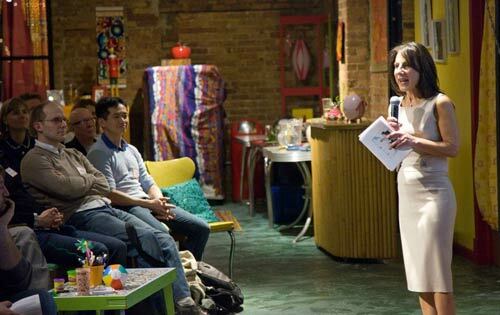 When I applied to Ignite Chicago, my goal was to debut my new presentation, ‘Got Mindfulness’, to a general audience. Ignite seemed like the perfect crowd (and it was). The five-minute Ignite format forced a ruthless discipline on my presentation development and this did get me closer to my goal of making mindfulness make sense to a general audience. You must have unassailable faith in the power of focus to carry your story. Backstory is irrelevant. Jump into the deep end of your story and find a single focal point. Use your five minutes to chisel and polish until it sparkles with a deep, brilliant glow. Know your audience and speak from their point of view. The Ignite audience is high caliber, driven and focused -– and constantly plugged in. I used technology metaphors to compare and contrast how stress leads to burnout and how my own crash-and-burn experience led me to mindfulness. Make like Homer and become an oral storyteller. I used an entirely different creative process to shape ‘Got Mindfulness?’. I set up my video camera and started talking. Talk, watch, more talk. After a few days of this, I had a good sequence and it was enough to put together a PowerPoint. I used high-concept, full-screen images to create visual metaphors that reinforced and supported my presentation. Don’t underestimate the need to rehearse. A lot of the success of a short-format presentation rides on performance. My rehearsing time was interrupted by a bout of the stomach flu just three days before Ignite. I resumed rehearsal the day of the event and I was still rehearsing in the ladies’ room at Catalyst Ranch up until the time the program began. I had one small ‘Madonna moment,’ but otherwise everything went smoothly. All in all, I spent about 20 hours rehearsing. Lead strong. Engage your audience right away. I was the last presenter before the break and followed some very high-energy speakers. I took the stage ad libbing: ‘Wow, after all that great energy, I’m going to dial it way down.’ Get on the same wavelength with your audience, literally. Do something to synchronize your mirror neurons. Finish strong. Start with the end in mind. How do you want to feel at the end of your presentation? How do you want the audience to feel at the end of your presentation? At the end, when I asked everyone to take a nice, deep breath and the collective inhale was loud, I knew my audience was engaged. Don’t get camera shy. The video will live long after the live event. As soon as you take the stage, look directly into the camera and start talking. From time to time, look directly at the camera as if it’s another member of the audience. Watch how fast you talk. Many Ignite presenters speak like it’s a race against the clock. Five minutes is enough time to say what you have to say. If it’s not enough time, your presentation needs more work. 160 words a minute is slightly faster than normal speech and a good pace for presenting. Dress the part. Whatever dressing up is for you, do it. Looking the part enhances your credibility. Determined not to wear black created a sartorial crisis because almost everything I own is black. I tried on and dismissed several outfits before settling on a sleeveless sheath dress the color of stone. I was dressed, not over dressed, and the color actually worked really well on stage. Bess Gallanis is the founder of Speaking with Power and Persuasion, an executive communications consulting firm based in Chicago. She is a communication coach, speaker, journalist, a student of yoga and insight meditation and the author of Yoga Chick (Warner Books, 2006).